South Sudanese leaders should help end widespread use of child soldiers by suspending and investigating commanders who have recruited children, Human Rights Watch said in a report released today. Thousands of children have fought in the South Sudan conflict, including under commanders from both government and opposition forces. South Sudan’s conflict began two years ago today, on the night of December 15, 2013. 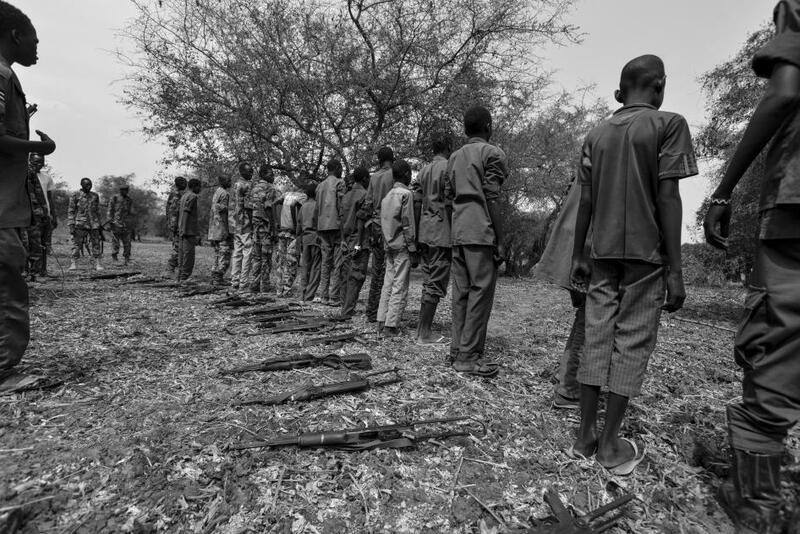 The 65-page report, “‘We Can Die Too’: Recruitment and Use of Child Soldiers in South Sudan,” names more than 15 commanders and officials from both the government Sudan People’s Liberation Army (SPLA) and the rebel SPLA-in Opposition and their allies who have used child soldiers. The report is based on interviews with 101 child soldiers who were either forcibly recruited or joined forces to protect themselves and their communities. They said they lived for months without enough food, far away from family, and were thrown into terrifying gun battles in which they were injured and saw friends killed. Children also expressed deep regret that they had lost time they should have spent in school – and many schools have been taken over my military, as seen in this video. The United Nations Children’s Fund (UNICEF) estimates that 15,000 to 16,000 children may have been used by armed forces and groups in the conflict. South Sudan’s civil war began in December 2013, when soldiers loyal to President Salva Kiir and former Vice President Riek Machar, now the rebel leader, fought in Juba, the capital. As the fighting spread, both sides targeted and killed civilians, including in gruesome massacres, often based on their ethnicity. Some 2.2 million people have been displaced, many from villages or towns that were burned and pillaged.